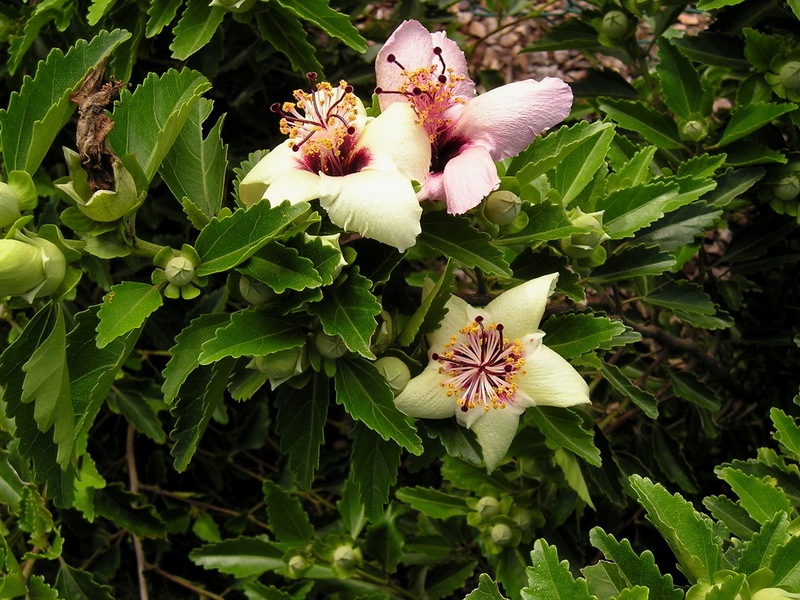 I have been instructed by Denise Horchner (of Perennial Poppies) to write about my Phillip Island Hibiscus, Hibiscus insularis. This is what I call my ‘signature plant’ and as far as I’m aware, I’m the only person who has used this species to create a semi-formal, flowering hedge. And my latest hedge is growing and flowering now. After it has finished flowering I’ll have to trim it back to create that hedged look. This will be its first cut simply because it was planted as tubestock in May 2004 and has only just got big enough to be worth training. One annual cut allows you to shape it semi-formally and if you cut it back after flowering it can initiate flower buds for the next season. In Sydney this species flowers for up to nine months of the year and while it flowers for an extended period it doesn’t flower in one huge burst of blooms. Flowers open a creamy yellow, darkening to a soft pink before (mostly) dropping off. Leaving a coronet-shaped calyx which often drips nectar well after the flowers have finished – a curiosity for I can’t think of any evolutionary benefit this might offer a pollinator (too late) or a vector of seeds (far too early). I’ve not yet found any viable seed on plants, although I believe they have set viable seed in Sydney. 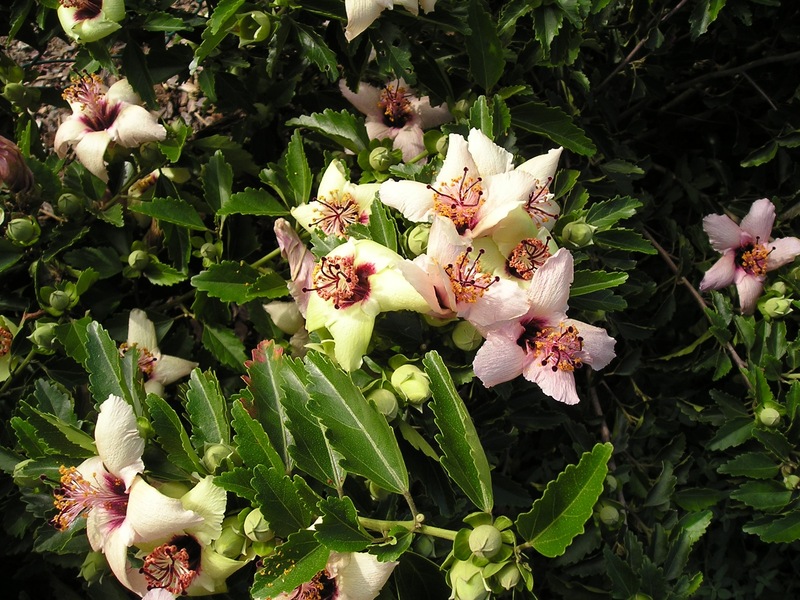 Sydney’s warm-temperate, sub-coastal humid climate is ideal for this wildflower because the climate is very similar to that of Phillip Island, part of the Norfolk Island group. 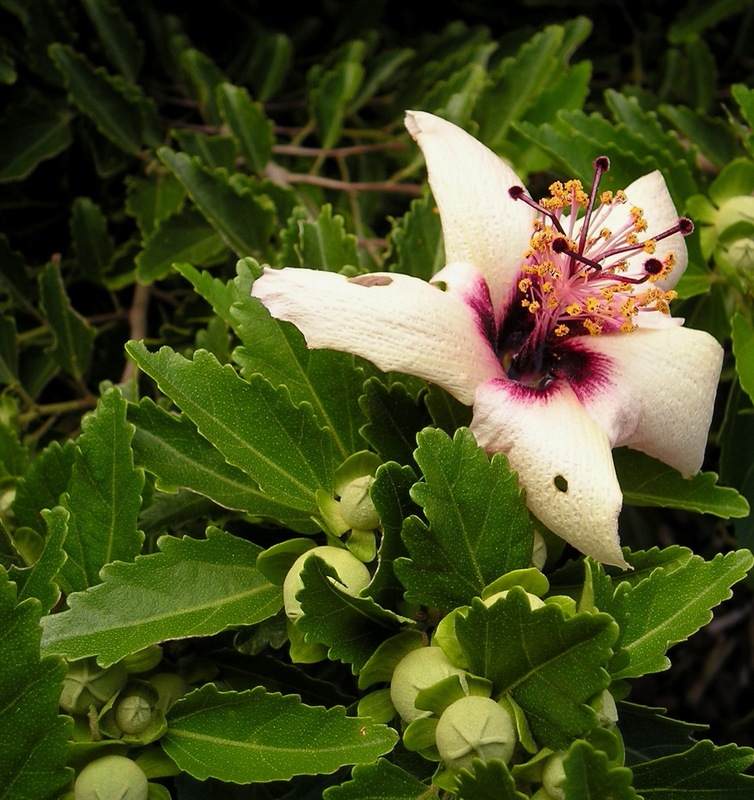 So to be accurate and to give the Norfolk Islanders the deference they deserve, what I’m describing is a national plant rather than an Australian plant. The Norfolk Island group is over 1,000 kilometers east of our east coast. While those islands are geologically and biologically unique, there’s an overlap between some of the wildflowers bridging the ‘them and us’ of botany and gardening. But those islands are remote and have been left to their isolation long enough to evolve their own unique plant and animal species. The Norfolk Island Pine is the unique tree species that most people are familiar with and only exists in the wild on the Norfolk Islands. About 30 or so years ago feral animals had eaten a lot of the soil-binding ground covers that prevented tiny Phillip Island from losing all its soil – as run off – into the oceans during rain. Fortunately feral animal activity is now constrained and the handful of surviving adult hibiscus have started regenerating by seed. To help things along the Royal Botanic Gardens, Sydney sent over seed and cuttings from about nine adult plants growing in their collections. When I was planning and designing the ‘Rare & Threatened Plants Garden’ for them I decided that this plant should be grown as a formal, clipped hedge to separate sections of that small garden. There’s many more side branches on this than most other hibiscus species, and this is important when selecting a plant to create a hedge. And that’s why other hibiscus hedges I’ve seen look so unworthy of the title ‘hedge’. They just don’t sprout enough to be clipped and look well-clothed in foliage and often quickly become leggy and sad-looking. The flowers outside are pretty much looking their best, dripping with sweet nectar, which local birds can’t resist. In fact many flowering side branches are almost horizontal from supporting feeding birds. Over time even lightweight birds tend to bend their soft slender branches. In the wild this plants makes a largish, spreading shrub with beautifully layered branches and neatly serried rows of tooth-edged, little leaves. Pruned as a shrub they reach 3 or so metres high and 4-5 metres wide. Allowed to grow as a tree they’re often multi-trunked with a broad arching canopy, reaching to 4 or so metres high and 4-5 metres wide. Storms can break tree branches when in flower. 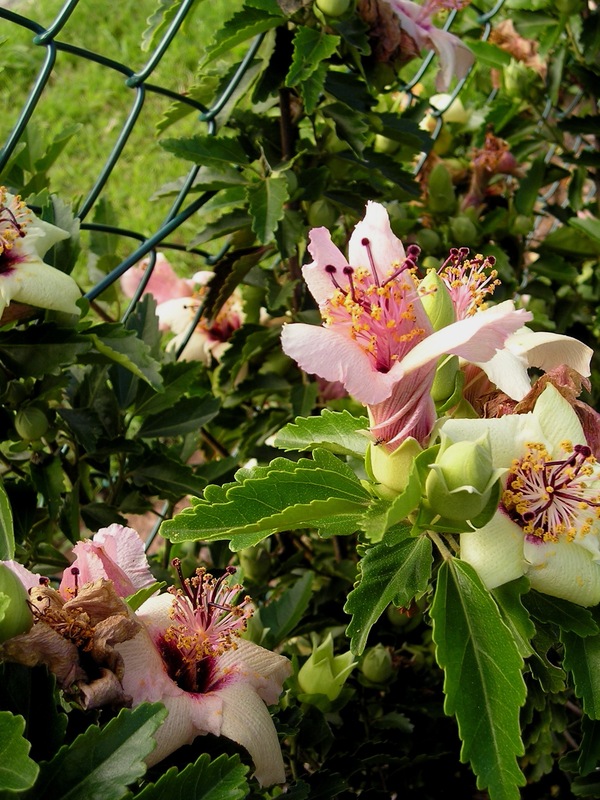 Left to nature a Phillip Island Hibiscus won’t survive in Brisbane. Our summers are a bit too hot, so their leaves go a bit yellow during high summer. They are damaged by frost too. But as our autumn arrives my hedge rapidly greens up and sets loads of flower buds in readiness for show time: flowering in late winter to early spring. 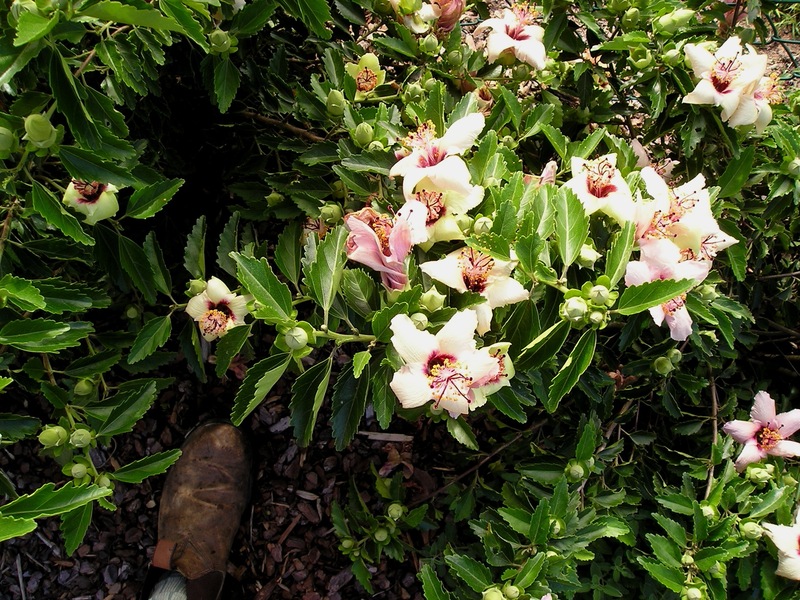 I’ve not seen a Phillip Island Hibiscus suffer from pests or diseases – so far. But they must have well-loosened, compost rich soil when you plant them. They must also have freely-draining soil just in case they rot in wet weather – a classic Brisbane summer might well be the crash test for mine. Mulch them to insulate their roots from overheating in summer making sure not to let the mulch touch the bases of their stems. I alternate between using chopped sugarcane, pine bark, mushroom compost and tea tree mulch because these materials feed different groups of soil microorganism, not just a limited range of bark-digesting fungi. Why the variation? Repeated use of eucalypt and pine mulches steadily increase activity by wood-digesting fungi and they tend to exclude other microorganisms, eventually converting the mulch particles into a water-repellent crust. In wet weather they can attack and harm plant roots, whereas varying the type of mulching material lets air and water percolate through freely and they favour bacteria, fungi and single-celled organisms, like protists. I feed mine once a year with a pelletised, blended, organic fertiliser in autumn. Once every month they get a foliar feed with liquid seaweed. Curiously enough this is the one plant in our front garden that has to be regularly watered. And there, as I said to Denise, is the irony. My front garden hasn’t been watered since about November 2004. The only plant that must be watered is an Australian – sorry – a National plant – but it’s one of the most beautiful of all of our wildflowers. Easily grown, though not so easily propagated, this is probably one of our best subjects for weakening the resolve in those who reject growing natives. I wish the councils and nurseries and societies would get hooked on this beauty. Seeing is believing. About a week to go before it passes its peak. I’m in Gladstone, (Ecofest city) and I have a Phillip Island Hibiscus growing in the garden. 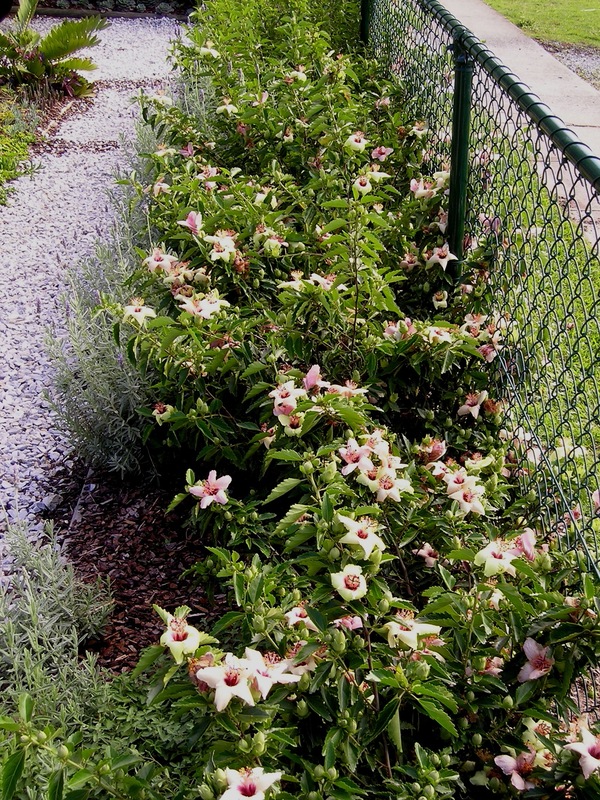 We bought this property in 2010 and Hibiscus was just a small shrub. It’s over 3m now and I’ve never watered it. Only relies on rain water. Our tree has just started flowering and it’s beautiful. I love your hedge. Lovely to hear, Lee. When I managed Sydney Gardens, around 2001, we filmed one of their oldest specimens. Growing in Lawn 29, it made an impressive tree-like shrub. A distinct and unique growth habit. Don’t tell me you spend your money in places run by idiots. 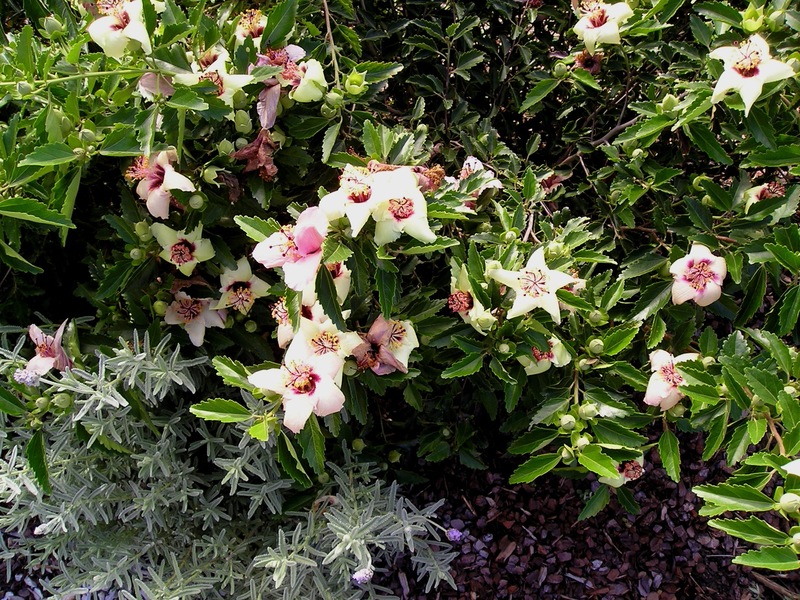 They can hang their heads in shame – clearly they don’t watch Gardening Australia – tell them to get an education by visiting the Royal Botanic Gardens, Sydney, where I pioneered using this as a hedge. The Friends of the Gardens may sell you tubestock cuttings. 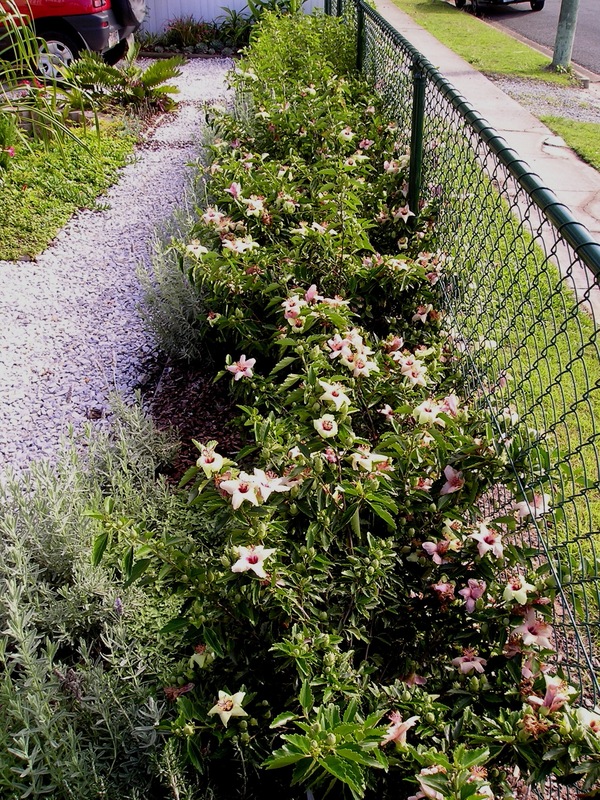 My hedge in subtropical Brisbane does fine. What utter crap they talk! Where can this be purchased from? Thank you so much in advance. The Friends of the Royal Botanic Gardens, Sydney. Indeed it would. Phillip Island itself is somewhat exposed to oceanic influences, isn’t it? For best results, I water plants weekly in dry weather. Terrific! …. do you know where I might purchase in Brisbane? Hello Jerry, I have a hibiscus Insularis plant in South Florida that has been in the ground for a year and a half. It’s a very healthy (1m x 1m in size) plant, but has not flower yet. Is it normal for the Insularis to take this long to bloom or perhaps Florida’s weather is not the right one for blooming. Also, any tips on how to propagate it? Currently I have a couple of cuttings that have been alive for three months, but they’re not growing at all. Other cuttings have die on me. Flowering depends on the source. If sown from seed, they take around 30 years to reach maturity and start flowering. If propagated by cuttings taken from a mature plant of flowering age (mine were) they flower within 18 months of planting. Hi Jerry, I want to plant a native hibiscus as a screen with my neighbour. 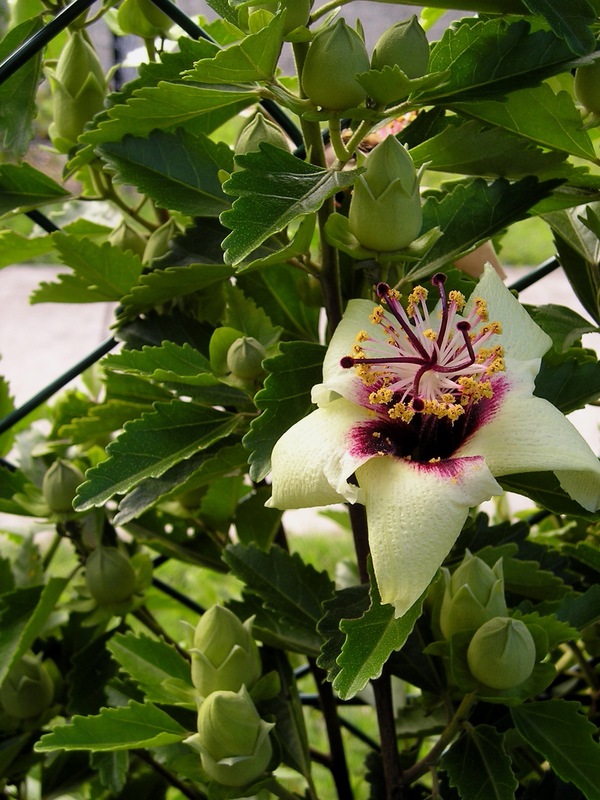 After seen yours at your garden open day and now reading this blog, I would love to get a Phillip Island hibiscus. However you mention it’s hard to find. I’m in Brisbane, do you know any place that have them or do you sell cuttings from yours? If not could you recommend another native hibiscus. Contact the Growing Friends of Sydney Botanic Gardens and ask if they can grow some. 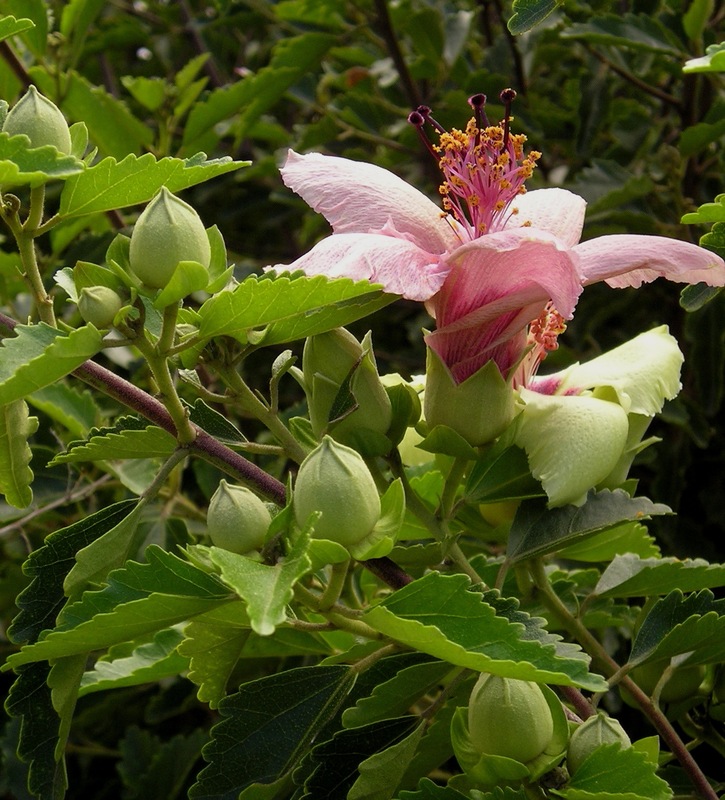 Hibiscus insularis is intolerant of frost and temperatures regularly above 30C can be harmful.